Indexed in: Scopus, Book Citation Index, Science Edition, EBSCO. From its early beginning in 1940s Nuclear Magnetic Resonance (NMR) spectroscopy has evolved into a diverse, powerful, and essential analytical tool with applications in numerous fields, including structural biology, pharmaceutical sciences, material sciences, medical imaging, etc. NMR spectroscopic techniques in biomarker-based disease diagnosis, quality control of food and medicines, drug discovery and development, and materials and forensic sciences. 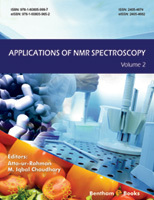 The eBook series, “Applications of NMR Spectroscopy” provides comprehensive accounts of cutting edge developments in these fields. This second volume of the series is an excellent compilation of five well written reviews, contributed by several leading experts in the relevant fields. Plant phenolics, particularly flavonoids and isoflavonoids, are known for their anti-oxidant properties. By virtue of this, plant phenolics are capable of preventing the on-set as well as progress of various diseases such as cancers, cardiovascular disorders, pre-mature ageing and neurological diseases. NMR spectroscopy is an excellent tool for the estimation, structure elucidation, conformation analyses, and study of hydrogen bonding patterns of various classes of plant phenolics in plant extracts, as well as in prepared formulations, and other health promoting products. Ziaullah and Rupasinghe have contributed an excellent review on the applications of NMR spectroscopy in the structure elucidation of polyphenols. Magnetic Resonance Spectroscopy (MRS) is a relatively new technique which is based on the same principles as NMR spectroscopy, except that there is no read-out gradient and the frequency information is used to identify different chemical compounds and molecular compositions of the samples. Ulmer and Ahlhelm provide an in-depth review on the MRS technique, and its clinical applications such as brain development, noxa during pregnancy, developmental delay, stroke, infections, mitochondrial disorders, as well as brain tumours and neurological disorders. Continuing the theme of medical and biomedical applications of NMR spectroscopy, Sing Muk Ng describes the recent developments of portable NMR-based sensors, such as NMR-MOUSE for onsite monitoring. These sensors are smaller in size and cost effective for on site in situ measurements. Despite their lower resolution, such portable sensors hold great promise for the diagnosis of diseases, etc, and deserve to be further developed for wide spread applications. Airoldi et al have contributed a comprehensive review on various NMR techniques employed to study the molecular recognition process, including target identification and validation in drug discovery and development, ligand-receptor interactions, ligand screening and optimization, and SAR (Structure-Activity Relationship) studies. Applications, and merits and demerits of several robust NMR techniques, such as STD-NMR, trNOESY, WaterLOGSY, NOE pumping, etc are extensively discussed. Structural biology is an important field in biomedical research. NMR has served as a key technique, along with single-x-ray diffraction, to determine the structures and dynamics of complex biological molecules, including proteins. Solution state NMR spectroscopy of proteins has numerous limitations particularly because of their insoluble nature. Membrane proteins are difficult to crystallize and also difficult to solubilize. In such cases, solid state NMR spectroscopy can serve as a viable alternative to solution NMR and X-ray crystallography. Mananga presents a comprehensive review of key mathematical formulations which have been developed to calculate various structural parameters from solid state NMR data. These include key structural biology parameters such as torsion angles, dihedral angles, bond distances and angles, etc. The authors who have contributed these excellent reviews deserve our special appreciation. We would also like to acknowledge the efficient management of the entire team of Bentham Science Publishers, especially Mr. Mahmood Alam (Director Publications) and Ms. Fariya Zulfiqar (Assistant Manager Publications).